Joanne Segars, chair of the joint expert panel (JEP) has today delivered the JEP's first report on the 2017 Universities Superannuation Scheme (USS) valuation. The JEP was set up as a result of the agreement reached between UCU and Universities UK (UUK) in April which was endorsed by members in a ballot and I welcome the publication of its first report. It has been a long standing objective of UCU to secure an independent assessment of the valuation process so today's first report is a very significant landmark in our ongoing campaign to defend members' pensions. 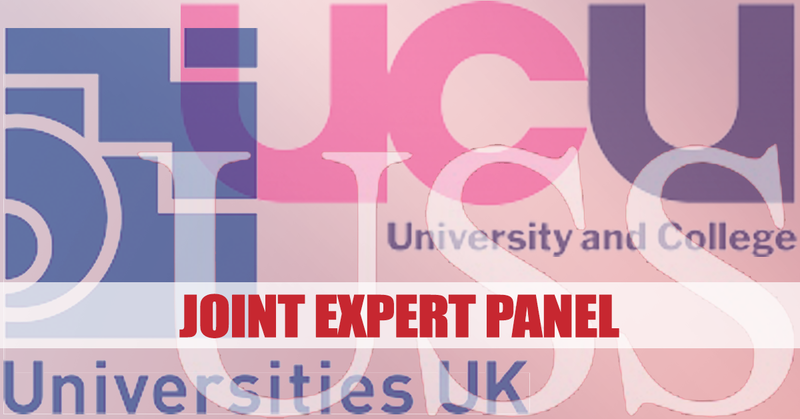 The JEP is made up of experts appointed by UCU and UUK from both the pensions sector and from our universities. The panel's findings and recommendations are unanimous. While there is an enormous amount in the report I have set out below this message the launch statement made today by Joanne Segars on behalf of the panel which summarises its key findings. There is no doubt that this report is a serious and constructive piece of work and it is to be hoped that all parties will engage seriously with its findings. I know that UCU members will wish to thank Joanne Segars and the panel for the detailed consideration they have given to USS. As the chair makes clear, the report was also hugely enriched by the contributions of many UCU members and I would also like to thank every one of you who submitted evidence. While members will no doubt welcome the JEP's unanimous proposal that the 2017 valuation should be adjusted, what is equally significant in my view is the panel's view that work should begin as soon as possible on 'phase 2' which would look in detail at whether there is an alternative methodology which could be used for future valuations. It is in all our interests that different ways of valuing the fund are examined with a view to achieving agreement and, given the academic expertise within the UCU membership, I believe the union is uniquely placed to contribute to that process. In terms of UCU's position, the JEP's first report will now be considered by the superannuation working group (SWG) next week. A meeting of the newly formed national dispute committee (NDC) will be convened thereafter and, in line with the policy agreed by our special conference, members' views on our next steps will be sought after that. There is no doubt that the union has come a long way since last autumn when we faced the imposition of a 'defined contribution' benefit package which would have reduced a typical member's retirement income by £200,000. The agreement to set up the JEP to look independently at the valuation was won on the back of great sacrifice by UCU members, both professionally and financially. We still have work to do but I want to thank you again for your help in getting us to this point.